Of all the artists who were part of the British Etching Revival of the early 20th century, Walter Sickert is the most original. He began his career as an assistant of Whistler and later came under the influence of Degas in Paris. In 1905 he returned to London and set up a press in Camden Town. At this time the Camden Town Group of painters was also developing under his leadership. His preferred subject-matter was that of cockney music-halls, figures in seedy domestic interiors and scenes of everyday working-class life. 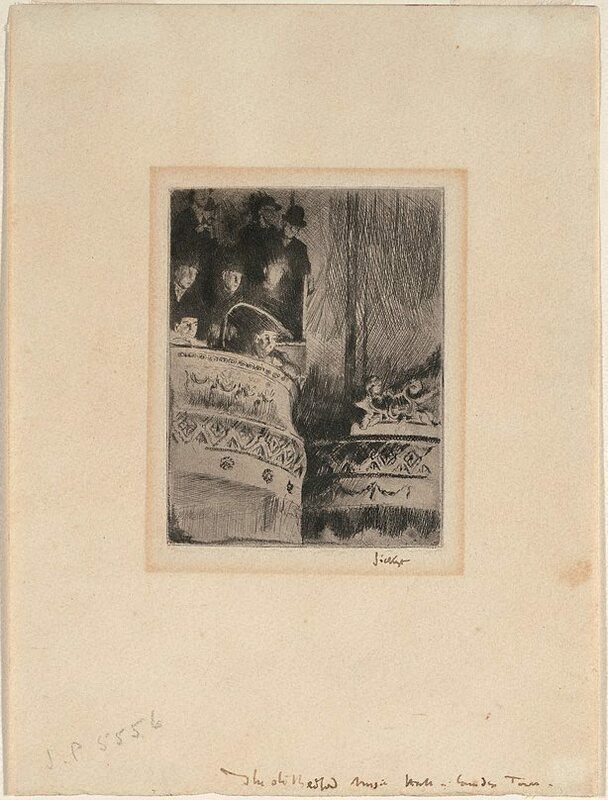 Sickert's etchings were experimental and unusual for their time - in technique, style and subject-matter. He scorned the views of the contemporary etching scene such as the idea of the limited edition and that each impression should be unique. He also disliked artistic inking and wiping effects (exemplified by Whister and his disciples), and claimed that etchings ought to be "printed like visiting cards" in a mechanical process of multiplication. 'The Old Bedford' represents a partial view of Sickert's favourite music hall which was demolished in 1896. Spectators, some wearing bowler hats, are in the gallery with its richly decorated front. To the right is another view of partial decorations which are surmounted by an ornament with a lyre. Signed l.r., brown ink "Sickert". Not dated. Cityscape 1910-39: Urban themes in American, German and British Art , 'From Order to Apocalyse - the City in British Art 1890-1940', London, 1977-1978.